Shuffleboard Rentals from WOW Entertainment start at 10 feet in length and include an authentic butcher block surface with a smooth polymer surface. 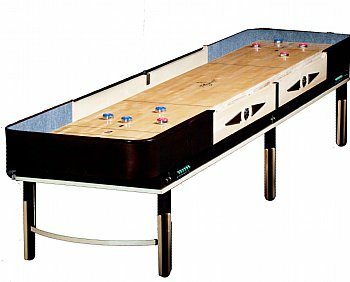 Shuffleboard Table Rentals include an electronic scoring if requested that the participants operate themselves. Shuffleboard Rentals include the two different sets of Shuffleboard weights or pucks to play. Shuffleboard Rentals can be customized with either the pucks being customized as well as the panels on the side of the Shuffleboard Table itself. As with all events conducted by WOW Entertainment, a professional event staff member is on site to supervise the Shuffleboard Rental unless otherwise requested not to be present. Contact a WOW Entertainment event specialist at 1-800-969-1196 or at info@wowincevents.com to discuss more about Shuffleboard Rentals and how this item can enhance your event.